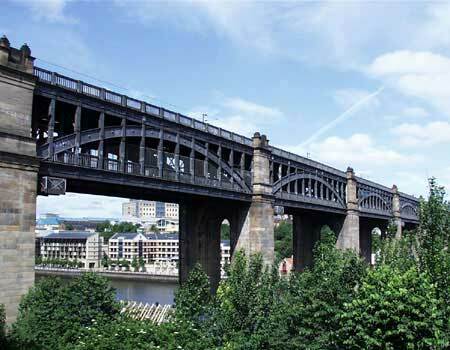 The High Level Bridge was designed by the engineer Robert Stephenson. Opened: 28th September 1849 by Queen Victoria. Designer/Engineer: Robert Stephenson and T.E. Harrison. Contractor/Builder: Hawks, Crawshay (ironwork). Traffic: Rail (upper deck), road (lower deck). Length: 1337 ft (407.8m). Width: 40ft (12.2m). The revolutionary design with trains on the top deck and a road below. It was the first bridge built with both cast and wrought iron. Trains first crossed 15th August 1849 - no ceremony. Road traffic first crossed 4th February 1850. The road deck was strengthened in 1922 to take trams.